For a temple that won't have some horned priest ripping your heart from your chest, hit The Beer Temple, dooming only your sobriety thanks to the cicerone/ certified beer judge/ video blogger who runs the joint, employing all that knowledge to bring you an optimal brew-browsing experience. 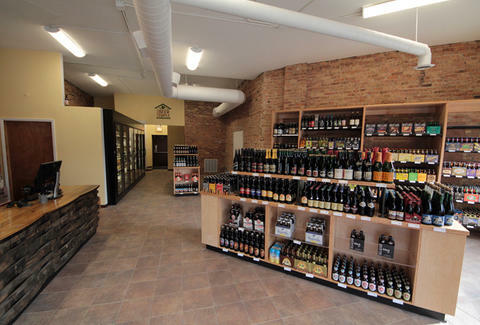 If you find yourself staring into lights in the store's beer cooler, you've either had too much already, or you've noticed their beer-friendly LED lighting, an alternative to the more common fluorescents that can taint the flavor of the beer over time. 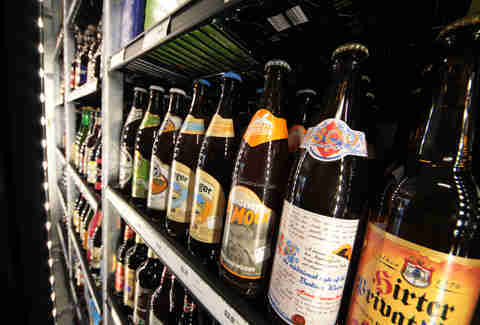 To ensure each bottle is fresh, the owner's deciphered the bar codes and posted a brew date on every beer. 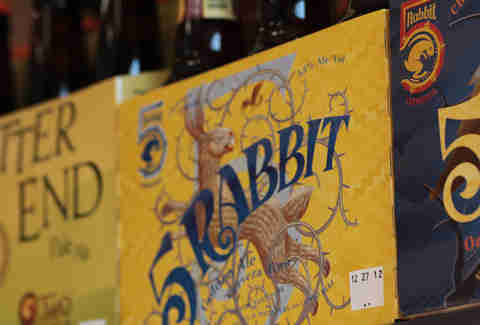 So whether you're seeking an imported Belgian Cantillon or just picking up a local six-pack like this 5 Rabbit Golden Ale, you won't get burned by skunkiness like so many of Pepe Le Pew's sexual encounters. They'll also be doing frequent tastings (on a counter made from the Pappy Van Winkle barrels Goose Island used for Bourbon County Stout and King Henry, no less), to give you a free taste of specialty suds like this Central Waters Y2K Catastrophe Ale -- a barleywine sporting caramel flavor and a much smoother finish than the one for that poor guy in the Temple of Doom. Kali MAAAA! !